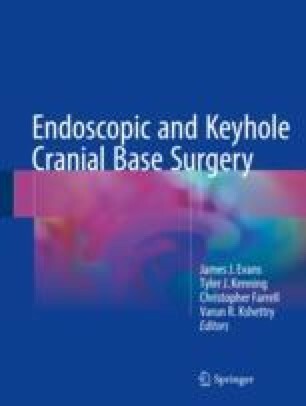 The keyhole supraorbital craniotomy provides a versatile approach to many vascular lesions and tumors of the anterior and middle fossa. Eyelid and eyebrow approaches allow the keyhole craniotomy to also minimize soft tissue trauma to the scalp and face. These techniques reduce initial exposure time, blood loss, and postsurgical pain and discomfort with very low infection rates compared to the traditional pterional approach. Both the eyelid and eyebrow incision have excellent long-term cosmetic outcomes and patient satisfaction rates.